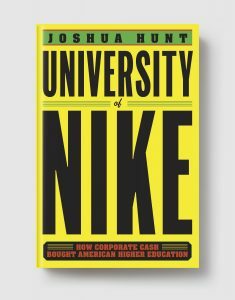 The dramatic exposé of how the University of Oregon sold its soul to Nike, and what that means for the future of our public institutions and our society. Hunt uncovers efforts to conceal university records, buried sexual assault allegations against university athletes, and cases of corporate overreach into academics and campus life — all revealing a university being run like a business, with America’s favorite “Shoe Dog” calling the shots. Nike money has shaped everything from Pac-10 television deals to the way the game is played, from the landscape of the campus to the type of student the university hopes to attract.